This is the second of two articles on the plight of mule deer in Wyoming. Last week’s story reported population numbers dropping 36 percent since 1990, changes to the landscape, the importance of fawn production and survival, and the diminishing contributions to Wyoming Game and Fish budgets from deer hunters — Ed. By Angus M. Thuermer Jr.
Chuck Kaiser, a deer hunter from Minnesota who has been coming to Wyoming every fall since about 1985, got a bad taste in his mouth when he hunted on Battle Mountain last year. After driving 16 hours from his home, he and a buddy were disappointed in the dearth of mule deer. Helicopters flying nearby and equipment stashed by seismograph crews helped him piece together the story. This year, before he comes West he’s making sure there’s no disruption from energy exploration where he chooses to hunt. At least Kaiser is still in the hunt. In Douglas, where mule deer have been heavily infected by Chronic Wasting Disease, buffeted by energy development and hit by other factors, sports store owner Jim Young hasn’t been out in years. Wyoming Game and Fish numbers show the herd in the South Converse Herd Unit, Hunt Area 65, at 41 percent of its objective population. Game and Fish estimates 4,900 deer in the area mostly south and West of Douglas. It has an objective of 12,000. A group of 45 biologists, hunters, ranchers, administrators and land managers met Aug. 6 in Daniel for the Inaugural Wyoming Mule Deer Summit to brainstorm how it might help boost the beleaguered herds. Game and Fish has an objective of 564,150 mule deer, but there are only about 374,400 in the state today. Their plight is such that advocates doubt whether the slate-hued muley can make a comeback. Chronic wasting disease generated little discussion at the summit, other than the recognition that it’s a problem in some parts of the state. 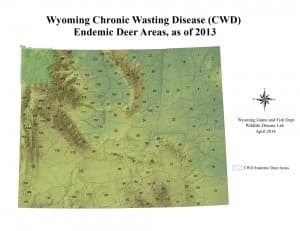 The relative of Mad Cow Disease and Creutzfeldt-Jakob’s disease in humans is endemic – maintained in the population — in 62 of 135 Wyoming deer hunt areas (46 percent), according to a WyoFile calculation made from Game and Fish map updated to 2013. “Within the historic endemic area, the prevalence of CWD in deer was similar to the 2007 and 2009 levels of 37 percent,” the Game and Fish’s 2013 annual report said. 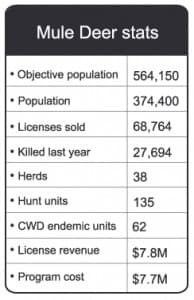 Hunters killed 303 deer in the south Converse Hunt Area 65 in 2011 and Game and Fish tested 35 for CWD, according to a 2013 “job completion report.” It found 20 infected with CWD, a rate of 57 percent — a high water mark in the state. On Aug. 3, the department’s wildlife disease laboratory in Laramie confirmed that a deer from a previously clean area — 97 southeast of Lander — tested positive for the disease. Wardens killed it after receiving reports of a deer acting strangely west of Muddy Gap, Game and Fish said in a statement. Game and Fish provides a list of reasons it doesn’t think people can get CWD from wildlife. “Nonetheless to avoid any risk of contracting any disease, parts or products from any animal that looks sick, or tests positive for CWD, should not be eaten,” the agency says on its website. CWD was discovered about 40 years ago but has been an issue for deer hunters in Wyoming for only about a decade. “When it first hit, a lot of people quit hunting them, with all the hysteria about it,” Young said. One family had its deer half eaten before discovering a CWD test on the animal was positive, Young said. Today, hunters are less fearful because “you get fast results,” from CWD tests, Young said. Also, infected animals end up withering eventually. Although he wasn’t aware of the high prevalence of CWD in Hunt Area 65, Young said that wouldn’t necessarily deter him from picking up his rifle again. “I wouldn’t have any problem, if the numbers were up, to go hunting again,” he said. Regulations allow hunters to transport meat and bones of an infected deer as long as the spine and head remain at the site of a kill or are disposed of in a landfill. Hunters can transport the skull plate of antlers, provided it is clean of all meat and brain tissue. While specialists at the Inaugural Wyoming Mule Deer Summit had their own views of the causes and solutions to mule deer declines, industrial development in the form of sprawling gas fields emerges as a significant contributor. Yet it may not always be addressed head-on in a state where mineral revenues relieve residents of a state income tax and where politicians staunchly defend the industry. That led Rollie Sparrowe, a retired federal biologist and past president of the Wildlife Society, to call the industry the “elephant in the room” — a looming but unaddressed topic. He pointed to the nearby Pinedale Mesa as an example of the effects of drilling on wildlife. A 2013 Game and Fish year-end report on the Sublette Mule Deer Herd said the Pinedale Anticline gas field overlaps with crucial winter range on the Mesa. The report undercuts political statements that Wyoming can have both full-scale energy development and high-quality wildlife. The Sublette herd, only part of which spends winters on the Mesa, is 28 percent below the goal of 32,000 animals. When losses of wintering deer on the anticline became apparent, Sparrowe went to a BLM leader and asked what he would do to make up for the degradation. “He didn’t have a plan to restore the herd,” Sparrowe told the summit. Savery rancher Pat O’Toole offered another example, pointing to the state’s decision to lease minerals on a school trust section on Battle Mountain for what he said was $1 an acre. “We’re not going the right direction,” he said of decisions being made in the country around the Little Snake River. With wind farms and wells, “that could be the end of that,” he said of the deer. “You tell me how you’re going to maintain the habitat. 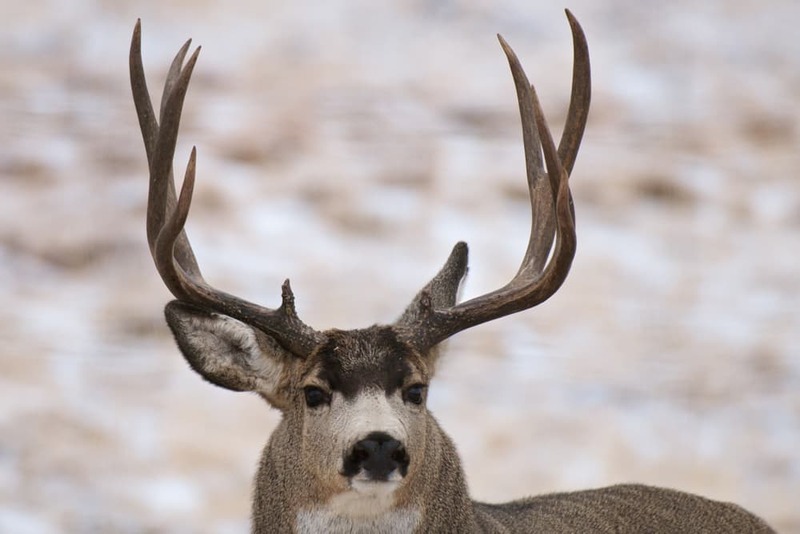 If mule deer advocates are going to make progress, it will be in cooperation with private landowners, many wary of conservation initiatives, summit members agreed. “There is a percentage of people out there that think ‘What’s the next step to come that’s going to regulate us,” said Josh Coursey with the Muley Fanatic Foundation. His poster-boy was at the summit. Ken James, who runs a ranch just south of the 1920 Daniel School House where the summit met, said he stopped by the meeting “to see what I have to do to protect myself.” His operations are pressed as it is, James said, excusing himself early to meet with federal officials and finalize a seasonal public-land grazing lease that’s been two years in development. Conservation groups, one of which is dedicated to removing grazing from public lands, will scrutinize it, he said. If such grazing leases aren’t renewed and stock gets pushed off the public range, he’d have no choice but to fence every inch of his land to keep wildlife off for the benefit of his cattle, James said. James also proposed what most in the group appeared to support. “The people who own this land and work on it know something about it,” he said. Another rancher, Wyoming Game and Fish Commissioner Charles Price, said the summit’s efforts need to be deft — not a cookie-cutter approach. “First and foremost you have to realized it’s their land,” said Bill Rudd, with the Wyoming Migration Initiative. Secretary of the Wyoming Wildlife Federation, Armond Acri agreed. “It should be about celebrating the key part landowners have in this,” he said. While ranchers are important, “livestock grazing should not get a pass like it did in core area,” Bohne said. He was referring to a state zone for greater sage grouse where the needs of the bird are supposed to be paramount. Mule deer are not a “sagebrush-obligate” species that requires the scruffy, ubiquitous Wyoming landscape. But most deer in the state are dependent on those habitats at least part of the year. Deer, pronghorn and sage grouse are in decline, Bohne said. Efforts to save sage grouse could help mule deer, said Holly Copeland, a scientist with the Nature Conservancy in Lander. She’s writing a paper on how conservation for one can help the other. Core conservation areas for grouse in the upper Green River area cover about half the migration trails that deer in that region use. Efforts to protect sage grouse “just about doubled the amount of conservation afforded [deer] migration routes,” she said. Her statistics came with a warning. Today, the big mule deer trek that Rudd and colleagues documented is under threat. While the deer hike a path 150 miles long, it is not very wide in places. 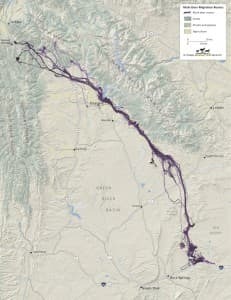 At the outlet of Fremont Lake near Pinedale between 4,000 to 5,000 deer traverse a 400-yard bottleneck through human development — twice a year. Private land there could be developed further. The southern end of their journey might also terminate prematurely. Radio collar data shows deer going south to Interstate 80, but not crossing it. Ultimately, the day-long summit adjourned without drafting a constitution, forming a nonprofit or forging any other official plan. Creation of new advocacy groups, “seems to be kind of a trend that’s exhaustive,” one attendee said. The group could become a steering committee for the Wyoming Sportsman Alliance. Or it could “fill some gaps in the state’s attempt to manage mule deer,” said Steve Belinda, an advocate with the Mule Deer Foundation. Commissioner Price warned about telling Game and Fish what to do. “Do not come in and say ‘do this, do that,’” he said. He called for leverage when it comes to asking the state wildlife agency for money. Money allocated to Platte Valley mule deer restoration was leveraged by a factor of seven and more, he said. A mule deer group could have made a difference in the state’s decision to lease the school trust section near Savery and Battle Mountain, said Ed Arnett with the Theodore Roosevelt Conservation Partnership. It could have generated a number of letters from influential groups protesting the leasing and underscoring wildlife values. How effective can one group be? There was disagreement. Steve Tessman, a biologist with Wyoming Game and Fish, said deleterious changes to the landscape are happening “in a manner that is bad for mule deer far more rapidly than we can offset.” Individual projects are like postage stamps in a sea of decline, he said. Another participant said the picture is not all gloom and doom — that habitat projects are being completed and are beneficial. A federal employee said work only gets done if somebody takes the initiative. There are policies out there now “we don’t comply with,” he said. One project, “I actually had to convince my management to let me do it.” He was told to construct the effort so it didn’t require analysis under the National Environmental Policy Act “so I didn’t overtax the people in the office with NEPA work. “If you have certain individuals in certain offices who don’t want to do it, it won’t happen,” he said. An influential outside group or consortium could add weight to pressing needs, convincing superiors “it’s not just a pet project,” he said. 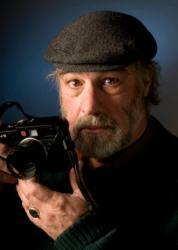 — Angus M. Thuermer Jr. is the natural resources reporter for WyoFile. He began working at the Jackson Hole News in 1978, and was editor of the Jackson Hole News and Jackson Hole News&Guide before joining WyoFile. Contact him at angus@wyofile.com or (307) 690-5586. Follow him @AngusThuermer. REPUBLISH: For details on how you can republish this post or other WyoFile content for free, click here. SUPPORT: If you enjoyed this story and would like to see more quality Wyoming journalism, please consider supporting WyoFile: a non-partisan, non-profit news organization dedicated to in-depth reporting on Wyoming’s people, places and policy. deer populations have always been naturally cyclic and changing, like our regional climate. Comparing a recent high to low can be disingenuous. A regional population decline can’t be blamed on the Wy. game and fish. A question that was critically missed, is how quickly do deer move back into areas after the drilling has been completed. The northern rockies and plains seem to be moving towards a wetter and productive clime. I believe it is also important to keep one concept at the front of the debate. 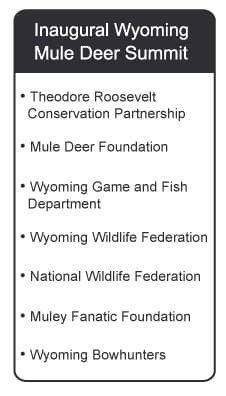 The clue comes in the title of agency responsible for managing the wildlife in our state. It’s the Wyoming GAME and Fish Department, not the Wyoming WILDLIFE Department. The difference between a ” game” animal and a ” wild” animal is much more than semantic. Wyo Game and Fish manages for GAME, not wildlife. Game is a huntable marketable revenue generating resource. Those redshirted agents are Gamekeepers, not necessarily wildlife proponents. The bottom line is Wyo G&F manages the resource according to money factors…revenue and expense… not biology or ecology, except as those relate to the former. G&F manages for big game hunter harvest yields, and robust fishing opportunity. So we have elk feed grounds and ‘ put and take’ fishing holes and a hundred other examples of farming out the wildlife resource . Dewey makes some really good points – the 10 ton elephant in the room is not just habitat, CWD, drought, tough winters and the various other impacts – it is really all of the above. Until we decide to tackle the tough issues many in the state want to avoid – mule deer will continue to struggle. I also find it interest G&F Commissioner telling the summit “don’t tell us what to do.” Somebody has to lead and with statement like that, it is not G&F. How about putting wildlife first for once? I’d like Angus to append this well researched essay to compare the situation in Wyoming with what’s happening one state north and south of us. I realize this is WyoFile and Not ColoFile or MontFile, but the comparison is really quite valid. Colorado was a 36 percent decline in their Mule deer population in 9 years, 2005-2013, attributed by their wildlife managers to brutal winters, human development fracturing the range, with some decline attributed to predators—except Colorado’s predators are not Wolves or Grizzlies, only cougars and coyotes. No mention of any diseases like CWS in explaining Colorado deer attrition. Montana’s declines are most evident in the western portion of the state, but are now happening in the eastern portion due to the one two punch of severe drought following brutal winters . All the western state’s deer herds on public lands are declining, as are the Canadian Provinces along the border. It really is a bit of a narrow view to just consider Wyoming alone. Here’s a very interesting pair of factoids. What were the populations of Deer ( both species combined) and Elk in what is now the Lower 48 States at the time of Columbus landing in the New World? Research indicates there were about 35 million Deer, and 12 million Elk. Those Elk used to range from the Berkshire Mountains of western Massachusetts all the way to the Pacific Coast. What were the populations of Deer and Elk at their low points in the very late 1800’s and earliest 1900’s ? Deer numbers plummeted to 350,000 in 1900 , one tenth of one percent of what they were before Columbus and again when they peaked at 25 million in roughly 2000. Elk numbers plumeted to maybe as low as a distressing 45,000 before climbing back to maybe 700,000 today, nearly half of which now reside in Colorado, which has 2.5 times the number of Elk as Wyoming presently. The reason for their demise was outrageous uncontrolled market hunting and outright killing by humans. We humans came very very close to exterminating all the Deer and Elk in the USA and of course the Moose (separate topic for another day, those Meeses ). What restoration we have had in Elk and Deer populations bringing them back from the abyss came thru awareness, conservation , Teddy Roosevelt and his ilk, and highly regulated hunting. The Deer herds came all the way back , but Elk only came back to a whopping 5 percent of their former numbers. Today , Elk numbers in Wyoming are climbing—even with apex predators— but Deer numbers are falling dramatically again. here and elsewhere. Add Deer to the list that includes Monarch Butterflies, Honeybees, Neo-Tropical Birds, and thousands of other species that are in sharp decline. In the larger animals, one common denominator is they are migratory animals, and it is getting mighty hard to migrate these days, whether fauna or fowl or flying arthropod. The humans are at it again. 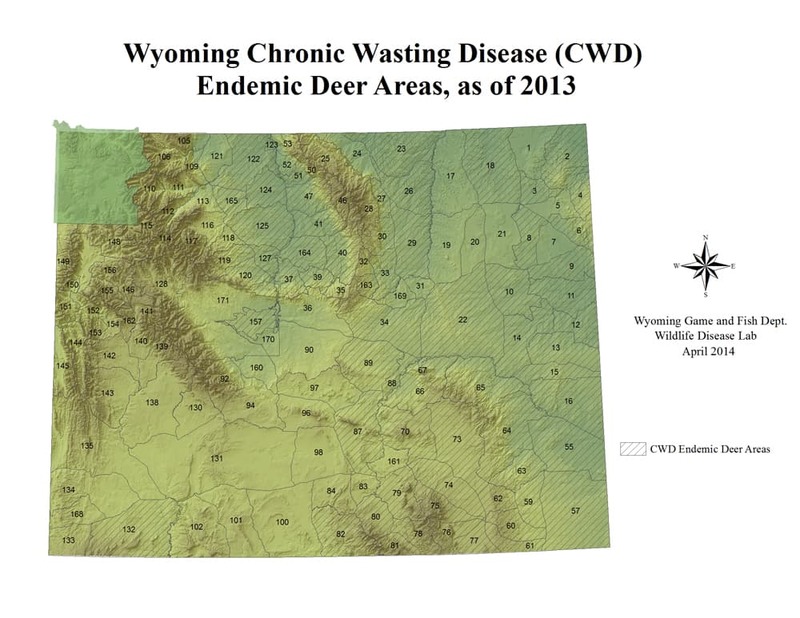 CWD is not the smoking gun for Wyoming deer demise. Rather, it’s an opportunistic side effect. One other point. The only time wildlife biology really concerns itself with the specific numbers of animals is when those numbers fall so low—the population utterly crashes—- so much so that each individual unique animal factors into the equations for restoration. Such as the 1970’s time frame when there were likely less than 130 living Grizzly bears in the Greater Yellowstone ecosystem. Genetically , that is close to zero. The GYE bears could use a healthy injection of DNA from other populations and a lot more room to roam and interconnect , but who is talking that ? Politically , it is suicidal to utter such heresy. SO whether Wyoming has half a million Mule Deer or ” just ” 350,000 the argument can be made the deer themselves are adapting to diminished viability on their habitat landscape. Who’s to say the best number of Mule Deer for Wyoming isn’t more like 250,000 given the withering impacts we humans are delivering to the land ? It is never about absolute numbers, only the relative population numbers with respect to carrying capacity and living conditions in proportion. It s not about the Deer, dummies…it’s the HABITAT. Always has been. Whatever it takes to halt the decline of Mule deer —if that is what you really want — it will have to occur in ten western states and three provinces simultaneously, with vigor. And a big stick. We will need a new Teddy Roosevelt . Thanks for the great information. This is such a multifaceted issue and I grow tired of folks blaming the Game and Fish for mule deer declines. Wyoming will have to decide whether we want to be a state known for its diverse wildlife or its booming energy industry. The science is clear we cannot continue they path we are on and have both.